I can finally see the light at the end of the tunnel of this One Room Challenge! I hope you’ve been following along, but if you need to catch up you can do so below. And, I almost did something crazy this week. I nearly decided to have the room painted white. The painter was willing to do it three days before the reveal, which was his first opening. I’ve been going back and forth about this for weeks. I love white walls, but now that the room is so close to being complete, I decided I am happy with the softness the light taupe provides. More importantly, I do not need the stress of having the room torn up that close to the reveal date! The paint color can always be updated later if I truly want a change. Other than the paint stress I brought upon myself, I devoted this week of the One Room Challenge to ironing. Luckily, my husband was around when it was time to get started ironing the new bedding. I am almost done, but not entirely. It is quite the workload! I believe the only thing that didn’t require ironing was the cotton velvet coverlet. I wish you could see it in person. 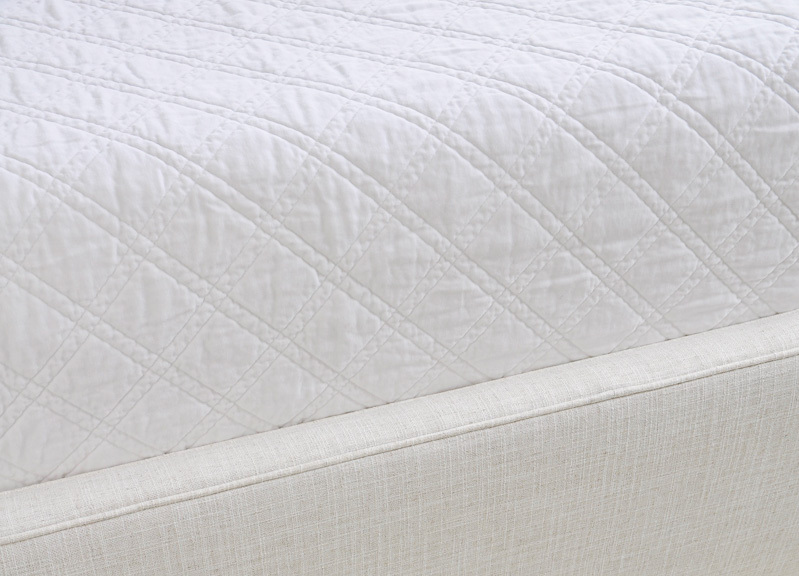 It might be my favorite coverlet of all time! We ironed almost everything else….. the duvet set, the euros, additional pillowcases, and the classic white sheet set. Now, they are in a pile patiently waiting to be styled. Don’t miss the star of the bed, the big white pillow with gold dots. As I mentioned last week, it’s 28″ x 36″ and it is beyond fabulous! I’m thrilled with all of the accent pillows. You can see a few details of the two lumbar pillows below, large and small. Fortunately, I found some reasonable 20″ down inserts at Joss & Main. I also found the Euro inserts there. They are made to order so they take a few extra days, but again, the price is great and the reviews are very good. I chose queen pillows and king pillows for the comfort of our future guests. You can find more guest-ready ideas, here. 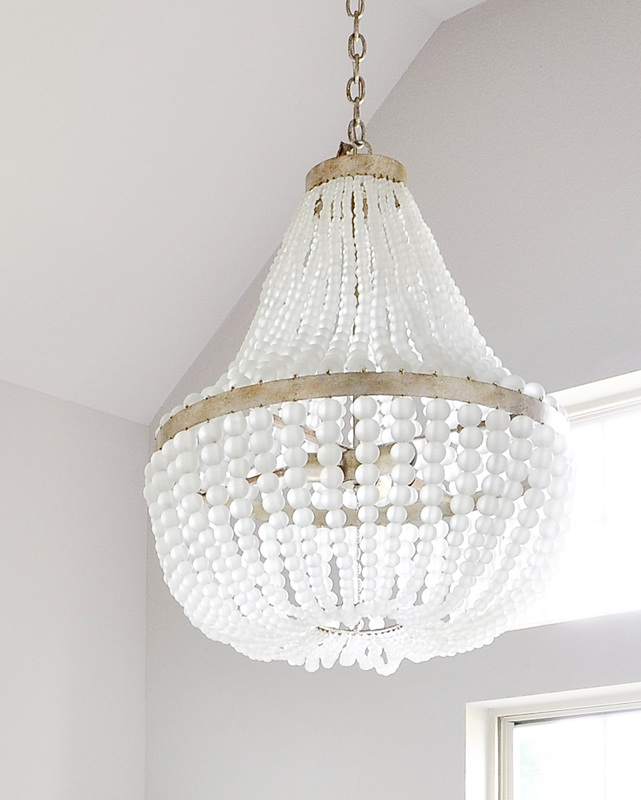 As the room begins to look more livable, I’m still completely in love with the chandelier by Currey & Company. Additionally, I had a chance to rest on the new Cariloha bamboo mattress. 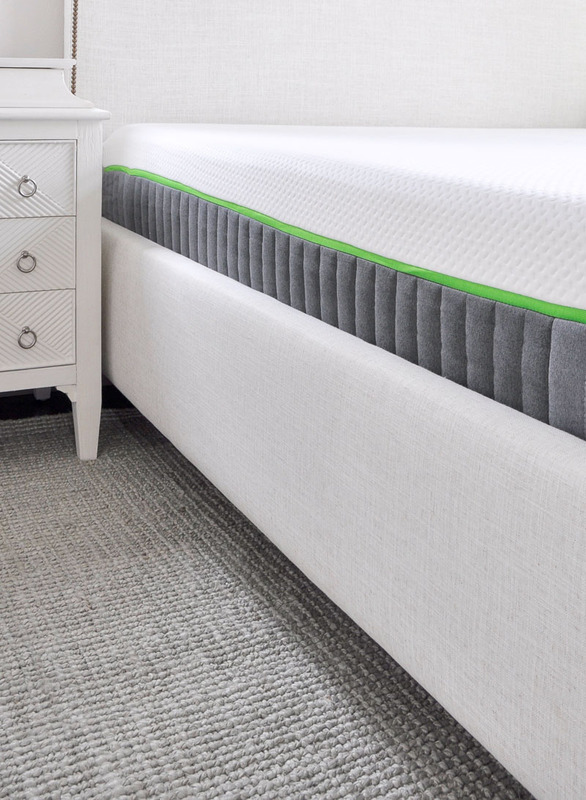 It’s super comfy and definitely feels cooler than a traditional mattress. 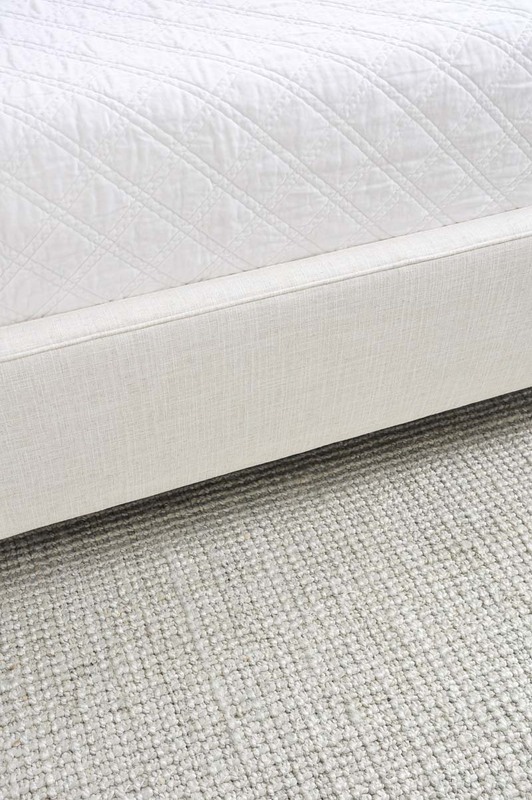 I considered returning my new box spring. Initially, I thought I might want one with a lower profile. However, I am so glad I stuck with this one for the One Room Challenge! 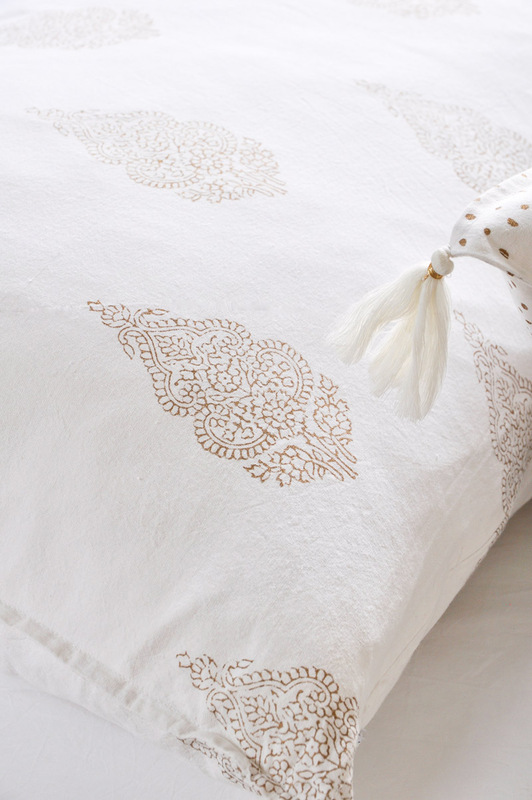 The bedding looks great with the details of the bed by Gabby Home. I cannot wait until it all comes together! Originally, I wanted to hang a gold mirror above the bed. But, I decided to go with this grouping of beautiful new art. I am trying it out here, but may choose to move it to the opposite wall because the room looks a little “heavy” on one side. Since I didn’t order the gold mirror for above the bed, we hung this round one next to the bathroom door. I meant to snap a picture of it, but I promise to include one next week. Reflecting on all components of this room, the rug has been my greatest challenge. I have two and I love them both. The gray one was meant to be the bottom layer and I was going to put a patterned one on top. I also have this one. It feels like heaven under my toes! I love it with the Aidan Gray chair, but I simply cannot find a way to make it work as a top layer in this room without cutting it down to a smaller size. Both rugs are by Jaipur Living and the quality is excellent. 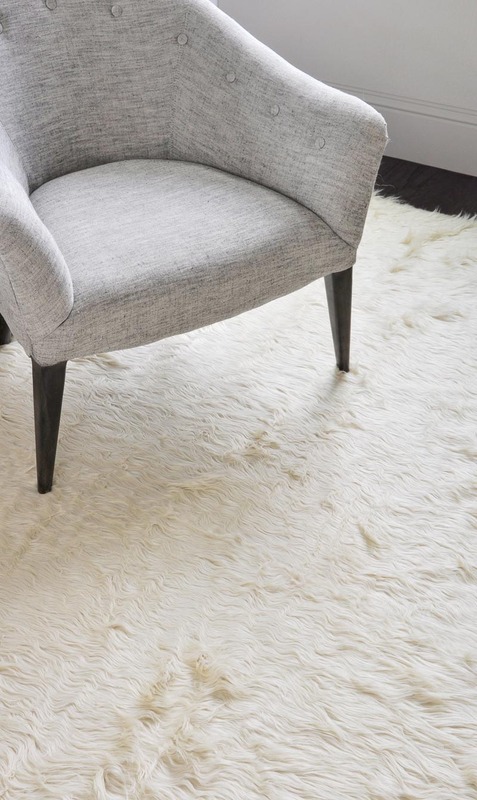 For purchase information on the rugs,Tobago Natural and Heron, please contact Jaipur Living (info@jaipurliving.com) and they will help you find the nearest retailer. I am still waiting for a few accessories and the remaining pillow inserts, but I am close and so excited to reveal our new guest room next week! Thank you so much for stopping by! Be sure to visit Calling It Home for progress updates on all of the room transformations! See you here next week for the One Room Challenge reveal! Follow me on Instagram for updates throughout the week in my stories! This is going to be a very serene room. I love the button placement on that chair. Can’t wait to see the finished room! Thank you Julie! The chair details are what I fell in love with too! This is stunning Jennifer! Can’t wait to see the finished product next week! Thank you Brenna! It’s hard to believe we are almost finished! You are the sweetest Bree! I hope you get to visit it someday soon! I am so glad you decided to keep the paint color. It really adds the most beautiful contrast to everything! I can’t wait to see next weeks reveal! Oh thank you Katrina! It’s always nice to have some reassurance when I struggled with a decision! You already know how I feel about that brass mirror – I’ve got quite the collection of them! 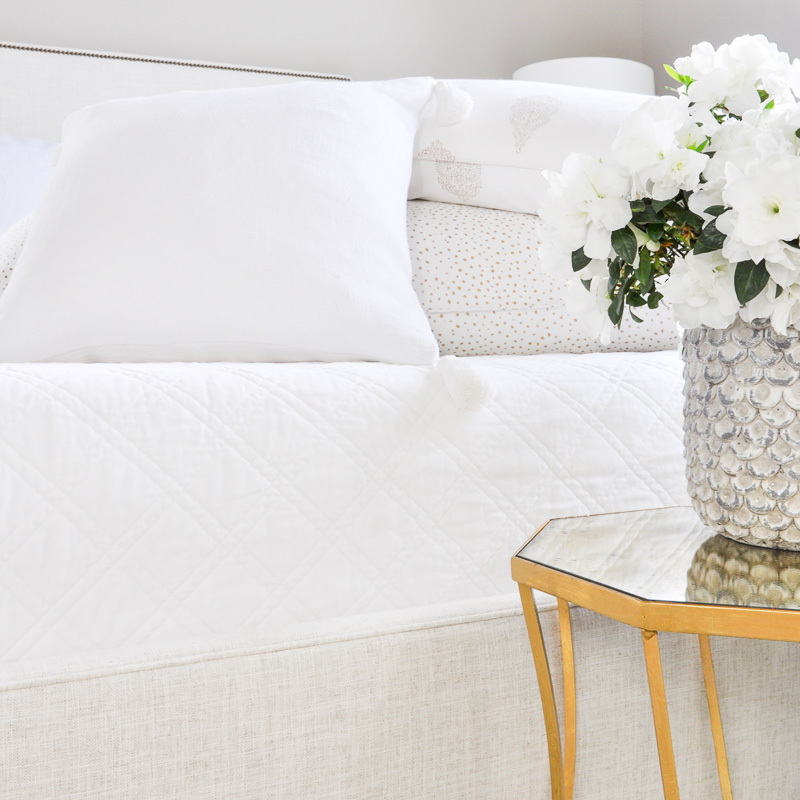 Everything is looking oh-so-fancy and inviting – perfect for a guest bedroom. That chandelier, though, has got to be my favorite part. And I loved the peek of the nightstands – so gorgeous! Yes, you and I are keeping Target in business with our brass mirror purchases! It’s surprisingly high quality for the price! loving all of your textures, and while i always love white walls, i love the gray with everything you have! Thank you! I love white walls too. I am just about ready to start at the front door and continue painting until every room is done! The colors are so beautiful. layering neurals is my favorite …and this room will be timeless!!! Cannot wait to see the REVEAL! I love neutrals too Lesli, so easy to use in a guest room. Thank you so much for your kind words! Love the carpet and the chair. Great textures andlooking forward to the reveal! Thank you! 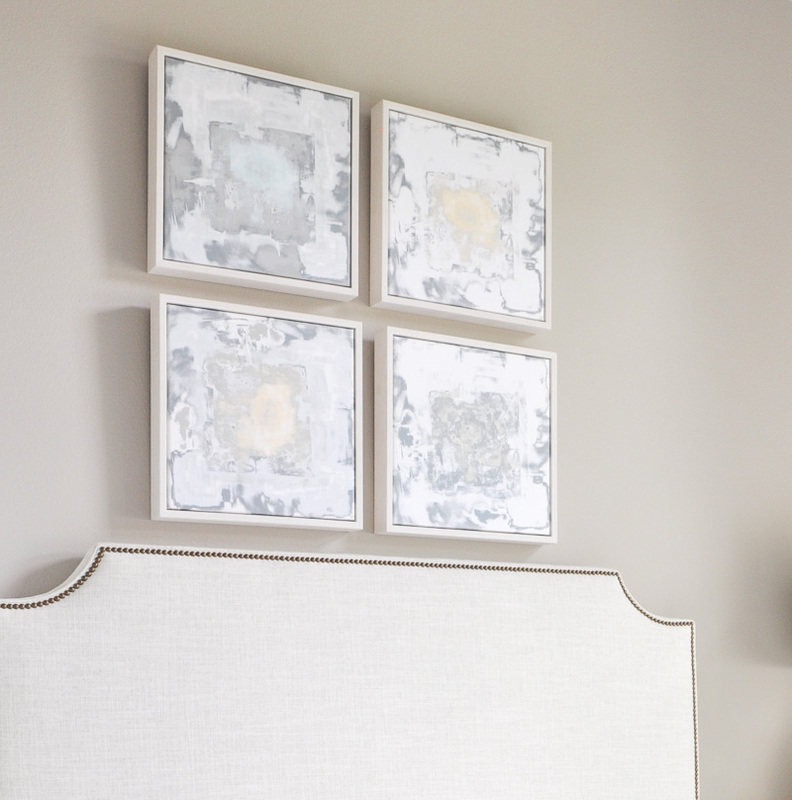 So glad you like the textures…I love adding dimension to neutrals that way! Thank you Randi! I am excited too!!! So close! Did I miss the links for the rugs? Hi Alea! You can contact info@jaipurliving.com for the retailer nearest to you. The silver one is called Tabago Natural and the cream one is called Heron. Hope this helps! This room is going to look amazing! I love all of the bedding/pillows. Did I miss the link for the artwork above the bed? I think it would work in my guest bedroom. I can’t wait for next week’s reveal. The details and textures are all just perfect! 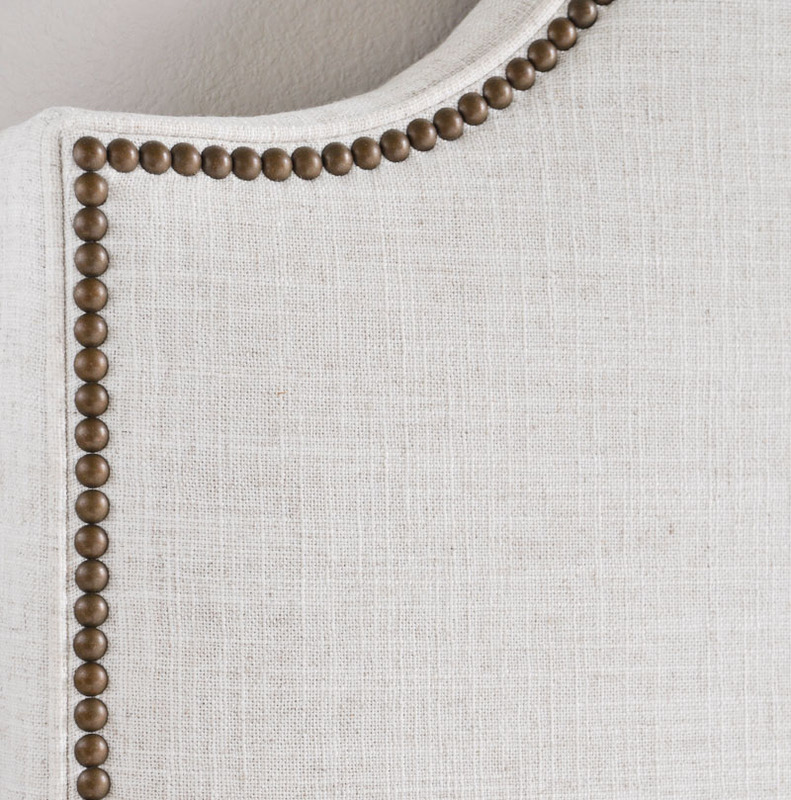 I especially love the nailheads on the bed!